Fencing requirement information and / or permits can be obtained from your local council, by either applying directly with the council or submitting through a Building/Planning Surveyor/Consultant. If the total of your spa/pool installation will be over $16,000 you may need to apply to be an Owner Builder or engage a registered builder. The Endless Spa Company is not a registered builder and as such cannot install swim spas, plunge pools or spa pools. It will take approximately 3 weeks to process an application for a certificate of consent if all required information is provided. The certificate of consent must be provided to your building surveyor or local council in order to obtain a building permit. White cards can be obtained by completing an Induction training course. Many online training companies allow you to complete them while you are at home. They usually take 2-4 hours to complete. Prices vary between companies. If you are engaging one builder to complete all the work you do not need to apply to be an Owner Builder. You will need to supply a Copy of the Certificate of Title and any other relevant information including Copy of the plan of subdivision and any covenant, Section 173 agreement or other restriction placed on the title. a) The allotment boundaries and dimensions as shown on the Title. c) Proposed location of the spa with dimensions, setbacks to boundaries and buildings. d) The dimensions of the proposed pool and enclosure. g) If boundaries are part of the barrier, please clarify height and side rails are on and type of fence. 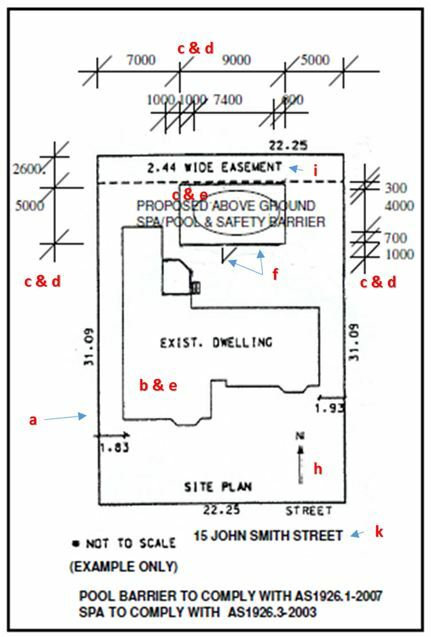 i) Easement locations and dimensions as shown on the Title. j) Spas over the easement or within 1m of a sewer asset will require consents from the relevant authorities listed as rights to the easement on the plan of subdivision. Ie drainage easement is council, sewerage is water authority.